This started out as a quickie project, I had 15 x BY8410 10kv 2mA diodes and a spare set of 8x 2n2 25kv capacitors. 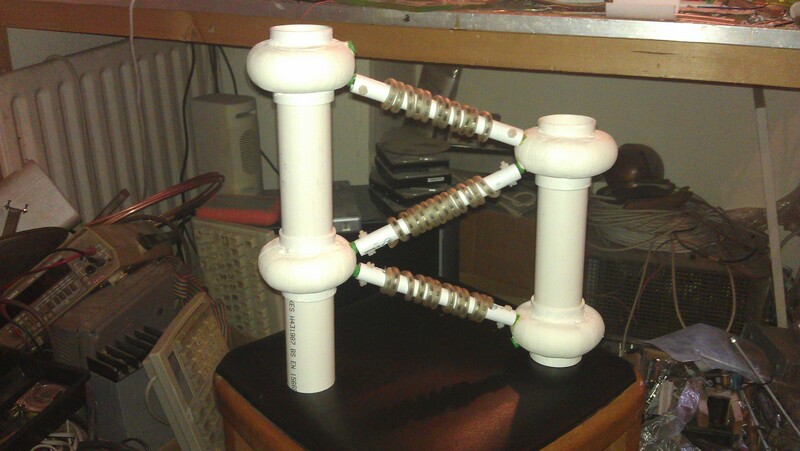 So I built a 3 stage CW multiplier stack. Quickly looking around for a PSU, I found a spare OBIT which gives about 25Kv P-P offload and I strapped the lot together. 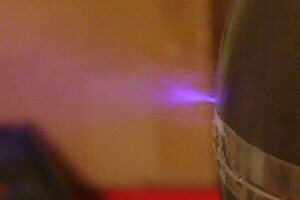 The project worked very well indeed, It leaked electricity from every un-insulated point, but I got a decent voltage from the top. This was fine untill I got too close with an earth and discharged the bottom capacitor through the bottom set of diodes (they selflessly gave themselves up to the cause). So from this earlier success I wanted to use all of my 8 Capacitors and ordered a stack of diodes. This time I went for the BY8408's as they are rated at 8KV 5mA, but used a stack of four in each stage giving me a per stage over spec to 32Kv. Each stage is insulated with silicon windscreen washer pipe, and the whole construction is (for now) taped to a peice of 1" trunking. The output of the stack is protected with 10 x 1M 3Kv resistors (well they are flash tested to >9Kv each !! ), and a set of 3 for each leg of the OBIT, to reduce charge up inrush. Wow, this thing will charge me up to more than 70Kv from about 1' away (I know this as I was standing on a 3" length of pipe and could feel arcs to ground through my feet.!!). 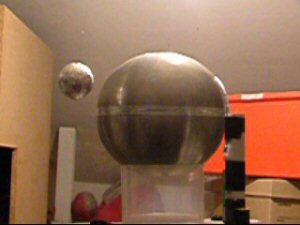 Flourecent lights light near it, It's like having an evil VDG, but with no moving parts..
A polystyrine sphere, coated with aluminium foil is placed on the terminal, as the power is turned on the sphere is repelled, it floats off the ball. 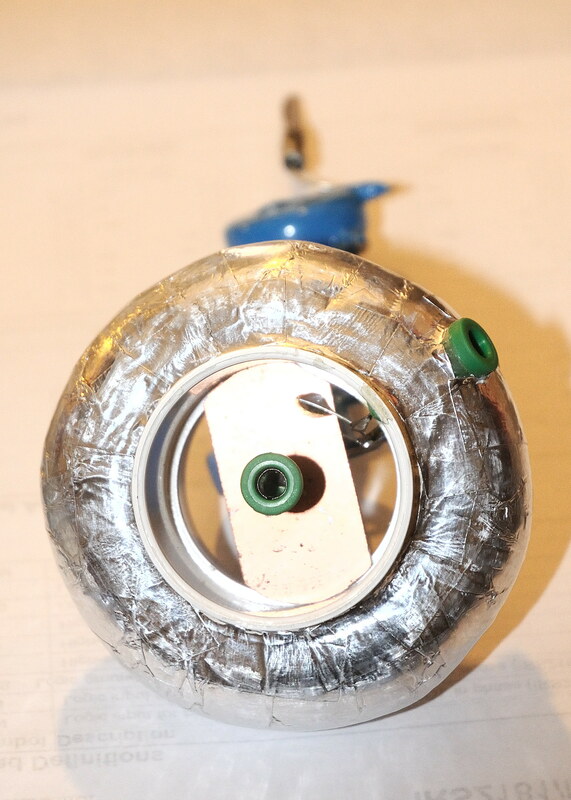 A ion motor, made from a bent peice of copper wire, placed on a crude bearing. 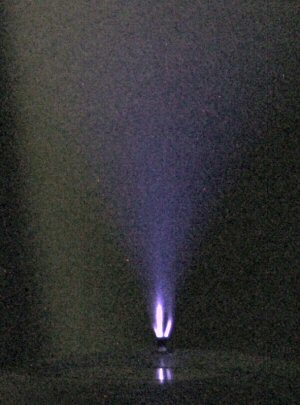 As power is applied the sharp ends of the spinner blow ion wind, pushing the spinner around. 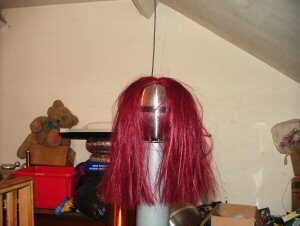 A wig is attached to the terminal, when power is applied the "hair" is all charged to the same potential, so each strand repells its neighbours. Click picture for the power on image..
As each pie dish gets charged, they fly off, one after another. 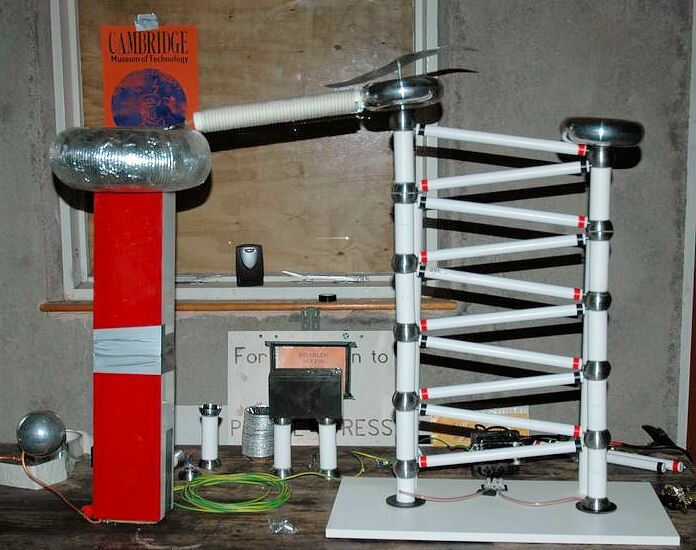 After the great success of the CWM at the Cambridge teslathon. I started to ask around for some more 25Kv capacitors. Dave Reeve, found 10 of them and donated them to the cause (Thanks Dave). This should give me a theoretical 200KV .. The first problem was that to protect the diodes, I had a string of 1M resistors on the output of the old CWM, this gave me a 20M @ 60KV , underated even then, It now would have to handle 200KV, a rebuild was in order. After asking around, the general idea was to use a pipe full of water to give me the value I wanted. After much experementation I managed to get a 20M resistor built with a 30" peice of 5mm ID silicone tubing wrapped around a 13mm former. The resistor was hard to measure, as the copper/water junctions gave about 0.15V, which totally confused my DVM. I eventually used a 24v supply and measured the current that the piping took across this, which gave me a more accurate reading of its resistance. The picture is of the CMWII with the outer cover and top sphere removed. 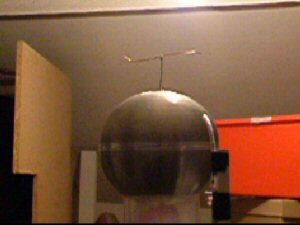 I had acheived breakout on an 8" diameter sphere, It worked!! 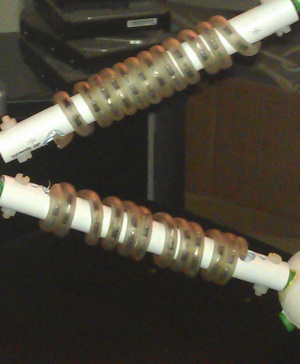 By using a small machine screw I could get some excelent discharges to the air. I then started to play with another eqarthed 6" sphere about 10" away from the CWM's top sphere, I got some really nice arcs between the too. I then got a single really loud bright spark, followed by nothing.. I found the damage, four of the HV diodes had blown, when the arc happened. these have been replaced, but I need to find out how the arc got past the safety resistor. I suspect either I'm getting more than 200Kv or the arc tracked along the inside of the outer pipe covering the CWM bypassing the safety resistor. 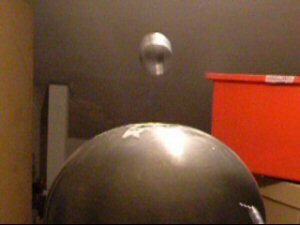 To prove that this CWM was an inprovement on its predicessor I tried to levitate a 1 1/2" polystyrine ball covered with aluminium foil. 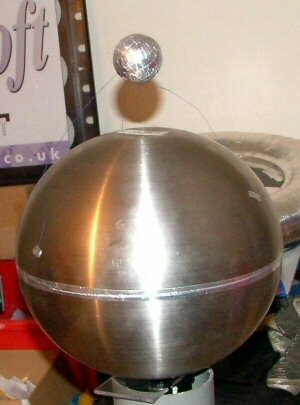 Previously I could only levitate a 3/4" ball, and then only with small strips of aluminium foil to keep the weight down. 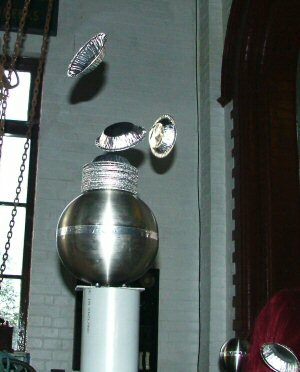 The picture is of an attempt I made to suspend the ball from three peices of cotton, this worked for a while , but the ball soon lost its charge and fell back to the sphere. Click on the picture for a video of the ball attached to the sphere with a single peice of cotton. After various plays with the CWM, I found that it was rather easy to get a spark big enough to blow the rather flimsey 5mA rated BY8406 diodes. So I started to hunt around for some better ones. I saw an auction on ebay for some 30Kv diodes rated at 200mA, and thought they would be ideal. 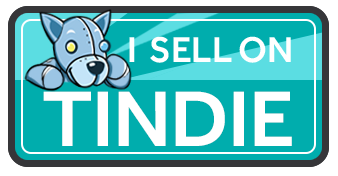 I won the auction and having a few minutes spare, I thought I would replace the diodes. 5 mins later, all 16 diodes replaced with 30KV doides, turned on the power and BANG!!! The 30KV diodes broke down at around 10KV, my ebay bargin wasn't quite so good and having only 20 diodes I didn't have enough to double them up. After a lot of searching around for replacement diodes, I eventually came to the conclustion that cheap off the shelf doides were the way forward, and bought a large pack of 1N4007's these are 1000V 1A diodes and cost me about Â£0.01 each , so a string of 30 would do for a single stage, 16 stages, 480 diodes would do the job. To ensure that I could get all of the string soldered neatly, I made a jig from two peices of MDF spaced 4mm apart with a diode sized hole in each. 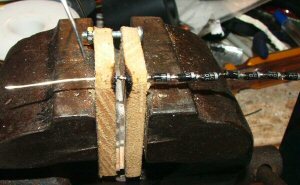 Each diodes leg was cut to 4mm long, and one by one threaded through the jig and soldered together in the gap in the center. This ment I had fairly even strings of diodes which eased the threading into the 3mm Silicon tubing. .
Each String was connected and wound around the "diode" leg of the CWM . I powered it up and it worked first time, back to getting breakout on the 8" sphere. I need to replace the rest of the anti corona insulation and I'm done. Ok, So I had a little play. 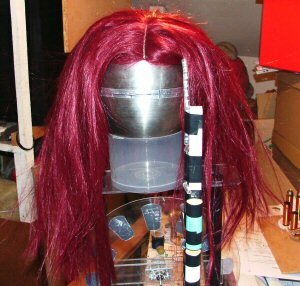 I haven't tried the experement with the wig with the 16 stage setup and I thought it worth a try. 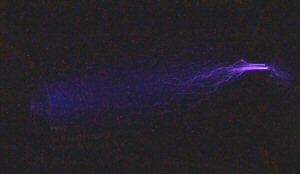 Click the picture to find out what it looks like with power..
After the great explosive failure of the CWM at the Cambridge teslathon. I decided a rebuild was in order. One of the big problems with the compact design was that there was frequent arcing between stages. When this happens it stresses the diode chains, usually taking out one or more diodes, untill the whole chain of diodes fails. 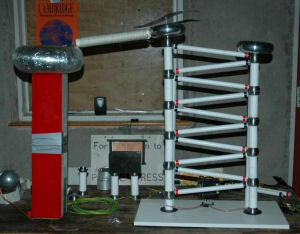 To prevent this in the new design the diodes are in strings contained in the small pipes across the center of the stack. the capacitors are in two strings up each of the pillars, and a third empty pillar supports the top. 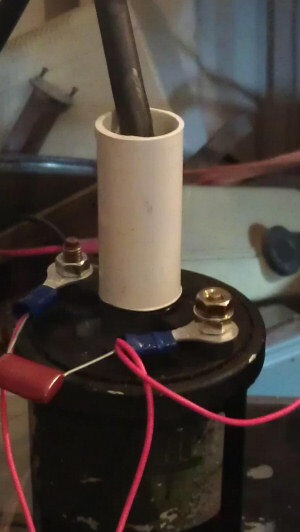 The capacitors are contained in a two pipes, the inner pipe has holes drilled on either side to allow connecting the diodes and capacitors, the second pipe fits as a sleeve over the first to prevent corona. 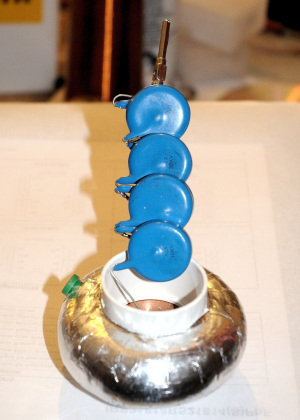 The top ball is offset to allow for the fitting of a safety resistor (not fitted). On powering up the stack it is much more efficent, I think this is due to the reduced leakage between stages. Unfortunatly I have a single cap that is rather weak, and if running the stack with no load it arcs over its entire length, I suspect either im getting more than 25Kv per stage or there is a tracking path on the case of the cap for this to happen. Ive picked up a couple of caps that ive got to try to charge........ In series I think .. I'd realised that there were a few problems with my last design. 1.There was still a large amount of leakage due to corona from the joints between capacitors and diode strings. 3.There was no diode protection in case of an arcover, replacing 32 diodes at a time was a pain. So I needed a Rebuild!! The diodes are made up from a string of 32 surface mount diodes BYG21M fast rectifiers. These are 1000V avalance raited fast 1.5A diodes. 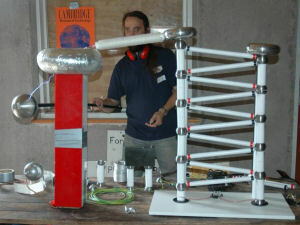 A string of 32 will give me a voltage handeling of 32KV giving me some overhead from the design volatge of 25Kv. 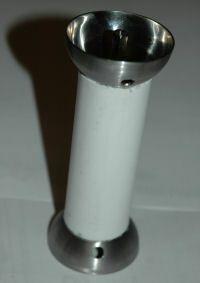 The whole string is encapsulated into a 20mm PVC tube. The capacitors are the same 2.2n and 1.6n caps used in the earlier CWM's. They are encapsulated into PVC tubes with small hemi-spheres (IKEA BLANDA 50mm diameter stainless steel bowls). Each capacitor unit is designed to be stacked on top of each other, and there is a hole to attach the diode strings. The top of each string of capacitors is terminated with 50mm x 8" torroids to reduce the corona leakage. With the addition of a water wouund resistor, similar to the one created earlier I can charge the two 200pF 100Kv Caps. So First light at Cambridge Thon, This was actually the first time I had had any power into the multiplier. Due to a shortage of IKEA Bowls and some problems with gluing the stainless steel bowls to the PVC there is only 5 stages rather than the 8 planned. 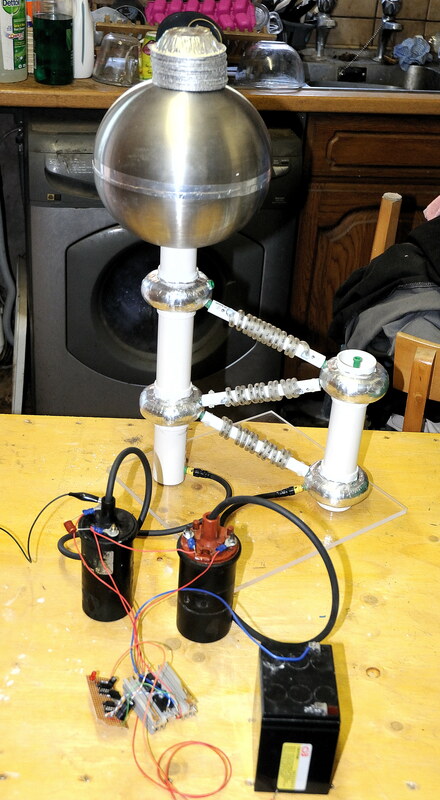 The aim is a 250 Kv power supply using 1 or 2 car ignition coils and a 4x multiplier. 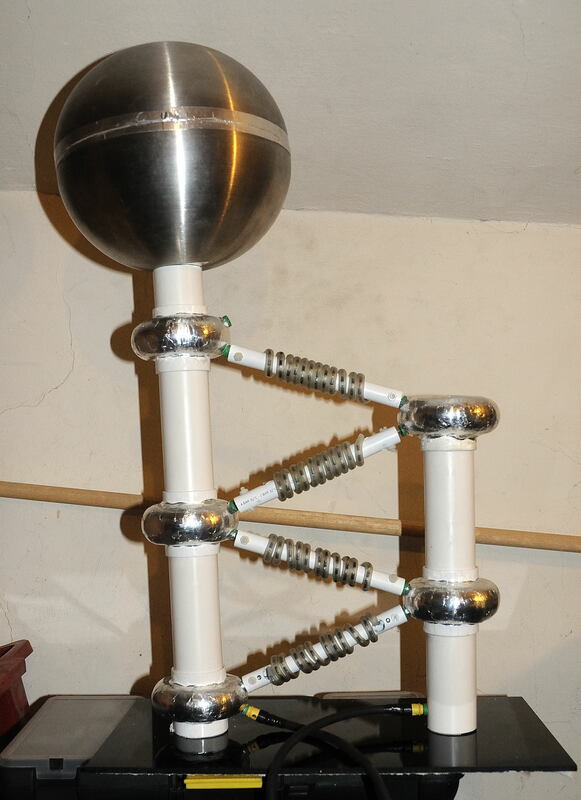 they are made from multiple 30Kv 10n capacitors. This Gives 0.25nF for each main leg and 0.5nF for the first leg. 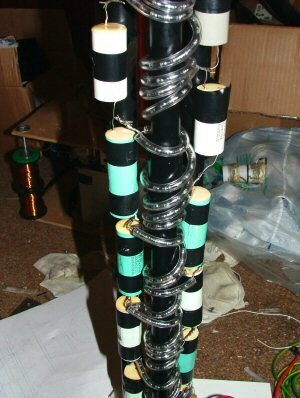 The diodes are in strings of 70 x 1N4007 giving 70KV per diode string. The anti corona "lumps" are made from air clay and are covered in aluminium foil to reduce corona at the joints. 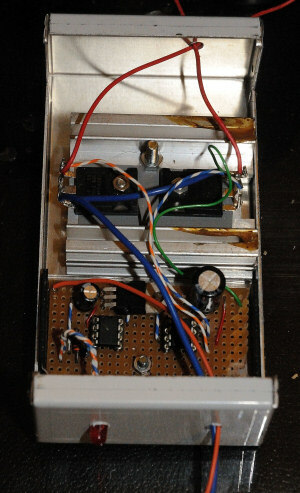 Each has 2 x 4mm socket connectors for the diode strings and another socket for the next string of caps. The bottom of the strings of caps has a 4mm plug to allow stacking. This allows for a drive signal that takes the ignition coil to saturation, turns off the current allowing the field to collapse and giving a HV pulse and then repeating the process with reversed polarity. The timing is roughy 3mS on and 1mS off for each polarity. The circuit above dosen't work. The kick back from the coils distroys the high side driver. 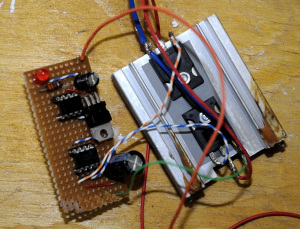 Clamping the pulse causes a very poor output. So the bridge idea has been scrapped. Two coils driven alternatly so each of them is driven to saturation with a single mosfet. As there is no high side driver, no problem. The down side is it will only develop half the voltage. First test setup. 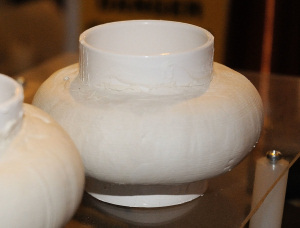 Pie dishes are to prove high voltage output. Running at around 50W now. 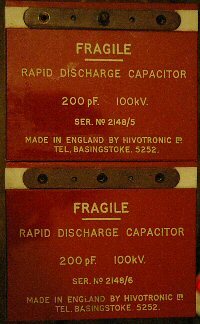 Down side, it gets dangerous, as it is possible to have a discharge backed by mains current. 300V driver put on hold. 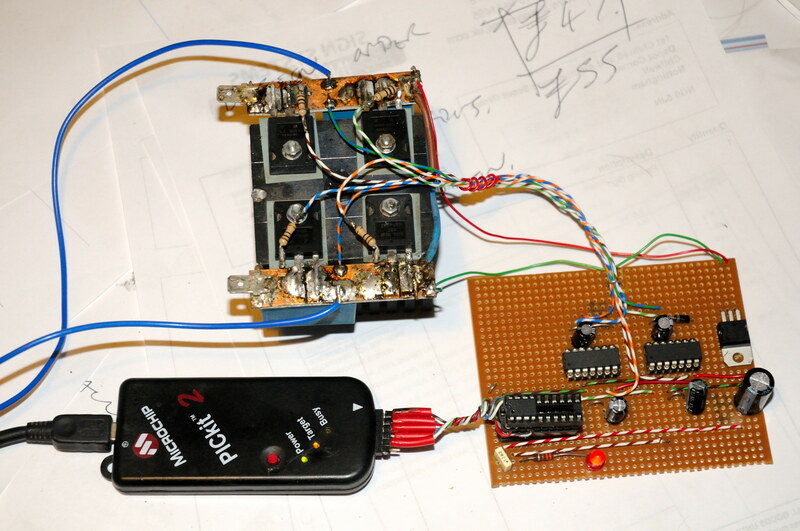 Tweeked the software in the existing driver to get nearer to coil saturation at 24V, both coils arced over. Added two tubes filled with wax to mitigate arcover. Now running at 4.2A at 24V (100W). Hisses and crackles like a hissy crackly thing.. Need some space and less moist weather to try it properly. Although the charge stays on the topload for a good 15mins, so I'm not getting much leakage. It will pull up the hairs on the back of your hand at a distance of about 50cm. I also want to run it in the dark to see where any leakage is. Schoolboy error, yes the first cap only sees only half the voltage of the other caps. But, it sees it as AC so must be rated 1.4 times half the voltage. Bad noises coming from first cap at fullpower..